The Golden Retriever Hip Dysplasia is one the most common medical issues for this beloved breed. The happy and loving personality of the Golden Retriever makes it an excellent choice for families with children. Unfortunately, the Golden Retriever’s popularity has led to careless breeding by “puppy mills” and other breeders, and the gene pool is not always as pure as it should be. Be sure to buy your English Golden Retriever puppy from a reputable breeder, if you want to be certain of a healthy, sturdy dog without any golden retriever hip dysplasia. Buying from a reputable breeder that only breeds puppies from hip and elbow certified clear parents. This malformation of the hip or elbow joint is common in Goldens, and leads to excessive looseness of the joint. Some believe that diet and environment are both equally a main factor for a puppy developing golden retriever hip dysplasia. As the dog grows, osteoarthritis is likely to develop, and pain increases. Effective treatment of symptoms is available with liquid glucosamine and chondroitin, which has an anti-inflammatory effect. In fact, veterinarians were prescribing this combination for arthritic dogs long before it became a popular treatment for people with arthritis! Epilepsy is a disorder of the brain that causes repeated seizures. A single seizure can occur from many causes, and does not necessarily indicate epilepsy: it is the repetition of seizures that characterizes the disease. You can think of a seizure as an electrical storm in the brain, causing involuntary movements of the body. In some English Golden Retrievers, epilepsy is genetically inherited. These dogs will begin having seizures at between one and three years of age. A dog with epilepsy can live a long and healthy life, if you work with your veterinarian to control seizures with medication. However, an epileptic Golden Retriever should never be bred, in case the epilepsy is of the genetic type. Your dog may be sensitive to a number of different allergens, including airborne pollen, certain foods or food additives, mold, and especially flea bites. If you observe your Golden Retriever chewing at his skin, suspect fleas: he may be trying to relieve the allergic itching. Consult your veterinarian for advice on diet and medication to relieve skin allergies. The form of hereditary heart disease most common in Golden Retrievers is Subvalvular Aortic Stenosis (SAS). If you are considering breeding your Golden, by all means have him examined by a Board certified veterinary cardiologist. If a heart murmur is detected, the dog should not be bred. A common eye problem among Golden Retrievers is hereditary cataracts, which sometimes may progress to partial or total loss of vision. The gene for Central Progressive Retinal Atrophy (CPRA) is present in some families of Goldens. Unfortunately, this progressive deterioration of the retina may cause complete blindness at an early age. Problems with eyelids and eyelashes are also fairly common with Golden Retrievers. It is true that Goldens are known to have fairly common medical problems. Nevertheless, if you buy him from a reputable breeder, have your dog examined regularly by your veterinarian. Environment and diet plays a huge part in the health of your golden retriever, so make certain his diet is varied and healthful. Make sure he gets plenty of exercise and loving interactions with you and your family. 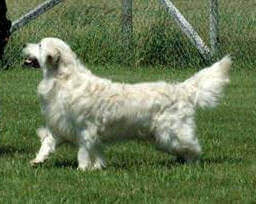 The chances are that your English Cream Golden Retriever will lead a happy and healthy life. And you can be sure he will be a wonderfully companionable member of your family!